If landed on acne treatment service page, you've must have tried different acne treatments such as oral antibiotics, topical creams, hormonal therapy such as contraceptive or even home therapy such as honey masks, over the counter products, but they failed you. Whether you have cystic acne, papules, and whiteheads, acne is worrisome to live with. But there's good news! There are several new treatments you might not know about. In this page, we will be focusing on the most effective acne treatment in Edmonton; Laser! In this page, we will discuss Laser, Microdermabrasion and Levulan Photodynamic Therapy System. We will not spend a long time discussing the causes of different types of acne. However, we will provide these two infographics picture to give a brief summary. 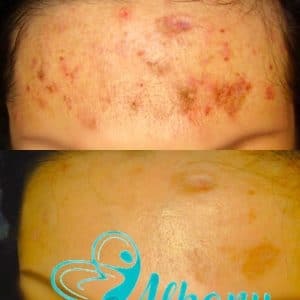 Most of the cases that we see at Albany cosmetic and Laser center are advanced cases and most of the patients are desperate as they saw their family doctor or GP and tried all traditional acne treatment. Therefore, we are specialized in treating severe cases that take patient and consistency from our team and the patients. You may have heard of laser hair removal treatment. But what does laser do to prevent and get rid of breakouts? When your skin cells don't shed correctly, it bacteria and sebum builds up and blocks the pore. But lasers target the bacteria to help remove acne. Further, it helps reduce any superficial scars and dark pigments. What is the recommended treatment protocol? It depends on the severity of the acne. If you’re experiencing breakouts, Dr. Khamal recommends six treatments a few months. It's necessary to reduce scarring, deep pigmentation, and rebalance the skin. The touch-ups will stimulate collagen production, prevent acne and make your skin glow. Will I see any improvements? Yes, your skin will look clearer and smoother. For those with sun damage and dark spots, that will reduce too. In general, your skin will look brighter, supple, and smother. What are the benefits of the treatment? Indeed, this treatment is not for everyone. But it is a powerful non-invasive treatment treats acne. What Laser do you use at Albany? One of our most advantages is that we have over 10 different laser types and wavelength. Therefore, we can customize the acne laser treatment according to your acne types, severity and skin types. Some of the most effective lasers we have are Fraxel laser, Dye pulse 532, 585 and ND Yag 1064 laser. Microdermabrasion is a skin rejuvenation treatment. It combines exfoliation and suction to remove bacteria. Other impurities include dead skin and excess oil from the skin. Also, Microdermabrasion is a noninvasive treatment that doesn't use chemicals. But it helps you get a clearer and brighter complexion. Further, the treatment is ideal for all skin types and colors. Also, it doesn't leave any scars. In fact, it helps reduce and get rid of scars! With microdermabrasion, you can get back to your normal activities after the treatment. What this means is, the treatment takes less time to complete. Also, you don’t need any safety recuperation time. There are 2 distinct types of microdermabrasion. The first type involves discharging small crystals at your skin under high pressure. These are aluminum oxide crystals, but they may contain different elements or diamond. The second type involves using a diamond-tipped wand or a crystal. It has an abrasive tip and gently exfoliates when it's swiped across the skin. The process doesn't release any crystals and it's safe for home use. With this tool, your doctor can adjust the suction level pressure to suit your tolerance. It's best to start with a low pressure to prevent bruising your sensitive skin. A lot of patients need more than one treatment session to get the best results. We recommend 1 or 2 weeks sessions spaced two weeks apart. Also, about 6 to 12 treatments are necessary, which may cost about $1,658. Microdermabrasion help boost circulation in the target area. Also, it enhances the function of the cell and boosts the production of elastin and collagen. As a result, it makes skin cells healthier and more resilient. As circulation increases, so does metabolism. This allows skin products to penetrate deeper into the epidermis for better results. Microdermabrasion is especially effective in removing blackheads. The suction removes the solid oily contents in your pores. And exfoliation eliminates the top of the blackhead. Clogged pores hold debris, which leaves pores open. But when they're unclogged, your pore size will reduce in size. Microdermabrasion is safer than other available acne treatments. You may experience redness and tightness after the treatment. But they'll reduce a short period after the treatment. Also, the recovery time is minimal and there are no side effects. In general, microdermabrasion encourages the production of elastin and collagen. As a result, the treatment helps reduce the appearance of acne scars by increasing the skin's healing process. The Light Levulan Kerastick Treatment is pain-free. Further, it is a non-invasive and effective treatment for moderate acne vulgaris. Further, the Levulan Photodynamic Therapy System is divided into two processes. The therapy utilizes the Blue Light Treatment and the Levulan Kerastick topical solution. The former is not a laser. But it emits visible, cool, and safe blue light to help reduce of acne. First, your aesthetician will apply a Levulan Kerastick topical solution on the acne. The solution will make the breakouts more sensitive to light. Further, your aesthetician will leave the topical solution on for about 2 hours. Next, the therapy proceeds with a Blue Light Treatment. The treatment session lasts for 15 minutes. You may feel minimal discomfort due to the nature of the topical solution. But the discomfort normally improves within 24 hours and as soon as the treatment ends. After the treatment, patients may experience minor reddening. Some will experience mild swelling around the surrounding skin. In general, reddening will reduce one week after the treatment. But swelling will reduce after two days. Medical studies show that Levulan Kerastick is an effective acne treatment. Your skin will look clearer, smooth, supple and radiant within 4 weeks.